Millefoglie – a thousand leaves – is better known in Australia perhaps by its French name, Millefeuille. As you can see in the photo, a Millefoglie is a magnificent and very fancy looking cake (a grand- finale- dessert), made with layers (or leaves) of thin and airy, flaky pastry. This one has three layers of pastry and two of different creams: the top layer is Chantilly cream, the other as you may guess by its delicate, green colour is crema pasticciera and ground pistachios. Look at the top of the Millefoglie and you have some crushed pistachios and some fresh strawberries. And there you have it, whether it is incidental, the red, white and green are the colours of the Italian flag. 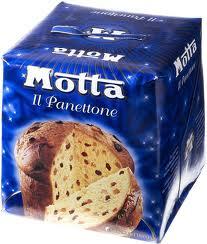 Both France and Italy have perfected many versions of this sweet. In Verona they make Millefoglie Strachin. This is layered with Crema soufflé and as the name suggests, it is a light and airy cream filling. Icing sugar is usually sprinkled on top. In Italy the Millefoglie is associated with celebrations, for example birthdays, baptisms and communions, weddings; the square shape makes it easy to cut into portions. The puff pastry is probably the most laborious to make and because it is usually a large cake it is customarily made by pastry chefs and bought from a Pasticceria. Mine was a gift and it came from Marianna’s pastry shop called Dolcetti. I have written about Marianna’s sweets many times on my blog because I think that she is very talented and makes a great range of delectable sweets. This Millefoglie looks stunning and tastes as good as it looks. I do not like over sweet desserts and I would describe this as being delicately sweet. I did not have to look hard for a recipe on my bookshelves either. Those of you who are old enough to have Le Cordon Bleu or Raymond Oliver’s La Cuisine will find recipes for Millefeuille – for making the puff pastry, Chantilly cream and almond custard (not pistachio). I also found a marvellous recipe in my copy of Grande Enciclopedia illustrata della gastronomia (Guarnaschelli Gotti). There are many recipes for making crème pâtissière or crema pasticcera or pastry cream in books and magazines and on the web. Here are two recipes from two belle dames of cuisine, one from Ada Boni and one from Julia Child. See English – language version below the Italian. Zucchero in polvere, g. 90 (3 cucchiai colmi) – tuorli d’uovo, 3 – Farina, g. 75 (3 cucchiai) – Buccia di limone o vaniglina – Latte, l. 0,500 – Facoltativo: burro, quanto una noce. Mettete in una casseruola lo zucchero e i rossi d’uovo. Mescolate con un cucchiaio di legno e aggiungete la farina e un pezzo di buccia di limone (evitando accuratamente la parte bianca) o un po’ di buccia di limone grattata, o una puntina di vaniglina. Mettete sul fuoco il latte e quando sarà quasi bollente versatelo a piccole quantità sulle uova, la farina e lo zucchero. mescolando e sciogliendo con una piccola frusta. Quando avrete aggiunto tutto il latte, togliete via la frusta e mettete la casseruola sul fuoco, mescolando continuamente col cucchiaio di legno. Vedrete che ben presto la crema si addenserà gradatamente. Continuate a mescolarla sempre e, raggiunta l’ebollizione, lasciate che la crema bolla per cinque minuti affinché possa perdere il sapore di farina. Appena tolta dal fuoco, se credete, aggiungeteci una noce di burro, ciò che le comunica una maggiore finezza. Mescolate ancora e mentre la crema si fredda non dimenticate di mescolarla di quando in quando per impedirle di fare la pellicola alla superficie. 3 egg yolks + 3 tbsp sugar + 3 tbs flour (I prefer to use corn flour) + 500ml milk.1 level tablespoon of butter, lemon peel, either grated or a thin shaving of the peel, vanilla extract (or 1 vanilla pod, halved lengthways and placed into the milk as it heats). In a saucepan large enough to hold the milk place the 3 egg yolks with 3 tablespoons sugar and mix it with a wooden spoon until it is creamy. Gradually add 3 tablespoons flour and mix it again till it is smooth. Add a thin strip of lemon peel or grated lemon and or a little vanilla. Heat 500ml of milk until it is nearly boiling. Pour the hot milk slowly into the egg mixture, stirring continuously and thoroughly so as to avoid lumps (I use a whisk). Place the pan on the heat and simmer, stirring constantly for about 5 minutes, until the cream thickens. Take off the stove and add the butter. Keep on stirring from time to time as the cream cools so as to prevent a skin from forming. To prevent a skin from forming, what I do and that is to place a piece of baking paper or cling film on the surface. Leave the custard to cool and chill it before using. Omit the butter and instead you could whip about 150ml cream and fold a little at the time into the cold custard. In a mixing bowl, gradually beat the sugar into the egg yolks and continue beating for 2–3 minutes, until the mixture is pale yellow and forms a ribbon. Beat in the flour, then gradually pour the boiling milk in a thin stream of droplets, beating continually. Pour the mixture into a heavy saucepan, and set it over moderately high heat. Using a wire whisk, stir continually, reaching all over the bottom of the pan. beating over moderately low heat for 2–3 minutes to cook the flour; be careful not to scorch the bottom (regulate the heat down, and keep stirring!). Remove from the heat, stir in the butter, and the vanilla. 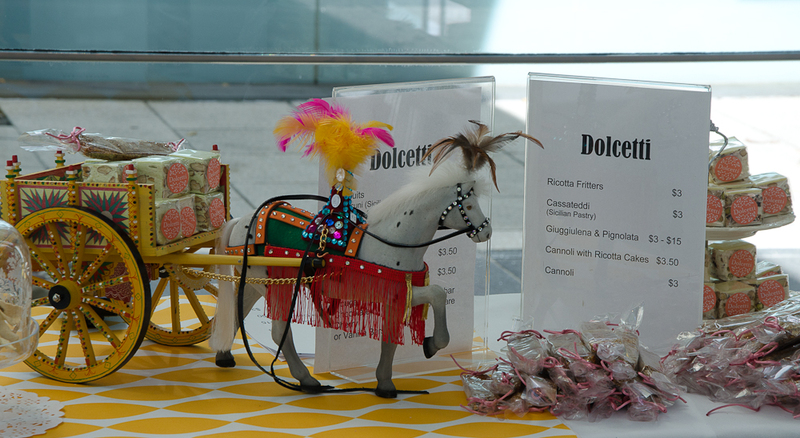 Dolcetti is a Sicilian inspired pasticceria focused on bringing the tradition of sharing exquisite sweets with family and friends to Melbourne. It always seems a time for scacce in Sicily, but particularly at Easter. I have already written about scacce (focaccia-like stuffed pastries) and for suggestions of fillings and the recipe and ways to fold the pastry, see the post called: Scacce (Focaccia-like Stuffed Bread). One of the most difficult things if you are a novice at making the traditional shaped scacce is the folding of the pastry. So, why not try just forming them into these shapes below instead. Use the same fillings and pastry as described in the post Scacce ( Focaccia- like Stuffed Bread) above. This scaccia (singular of scacce and not a misspelling) in the photo below is round and pie shaped. The filling is made from lamb and ricotta. The braised greens on the side could also be used in a filling – spinach or chicory or broccoli- softened/ wilted and then sautéed in garlic, chili and extra virgin olive oil (but drain well). There is a post for impanate with a lamb filling – a typical dish for Easter. The photos for these scacce (and pizza) are from a small eatery in Catania. The filling is made from slices of fried eggplant, a little bit of tomato salsa and a little bit of caciocavallo ( Sicilian cheese) – you could try provolone (cheese) instead. Or you could try small pasty shapes as in the photo below (circle of dough = filling on one side= fold over to make a half moon). 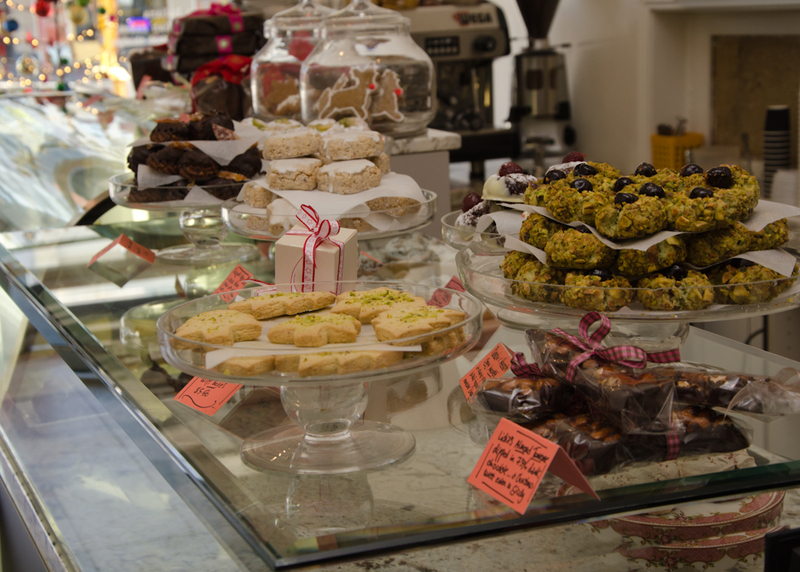 The pastries in the photo below are cooling on the racks in Dolcetti pasticceria (pastry shop in Victoria Street Melbourne). 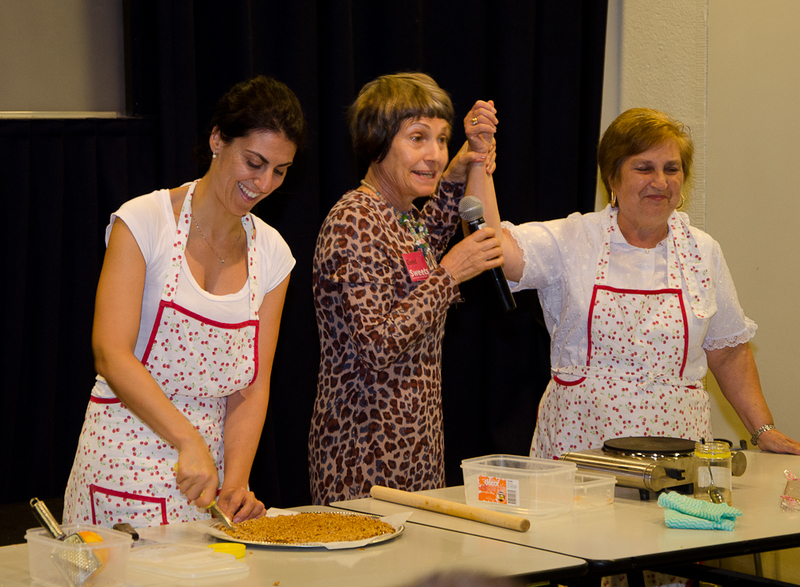 Marianna is the pastry chef and her mum is Lidia – and she is all Sicilian. Lidia visits Dolcetti each Saturday to make these pastries. She calls her pastries impanate. They are fabulous and she uses a variety of fillings. What about just a pizza ….. These pizzas (in the photo below) are from Pizza D’Asporto (Rifle Range Shopping Centre, Williamstown). They are made by Sicilians and are very good – worth a visit. Or what about a Sfincione? There are other Easter type recipes on my blog….just key in Easter or Pasqua in the search space. Go for it! Buona Pasqua! It is Christmas at Dolcetti; these photos speak for themselves (see link at the end of this post). 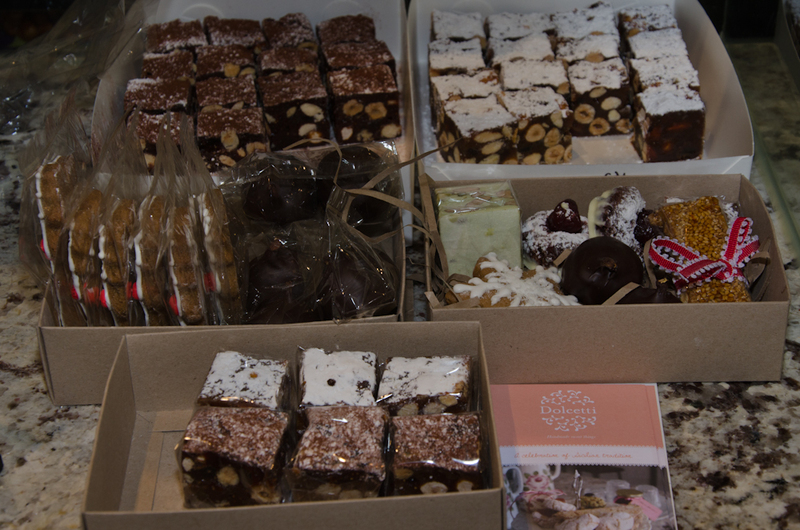 Marianna from Dolcetti is making so many traditional sweets for Christmas. There are too many to mention in this post but here are a few photos of what you can purchase from her Pasticceria (Italian for Patisserie) in Melbourne. 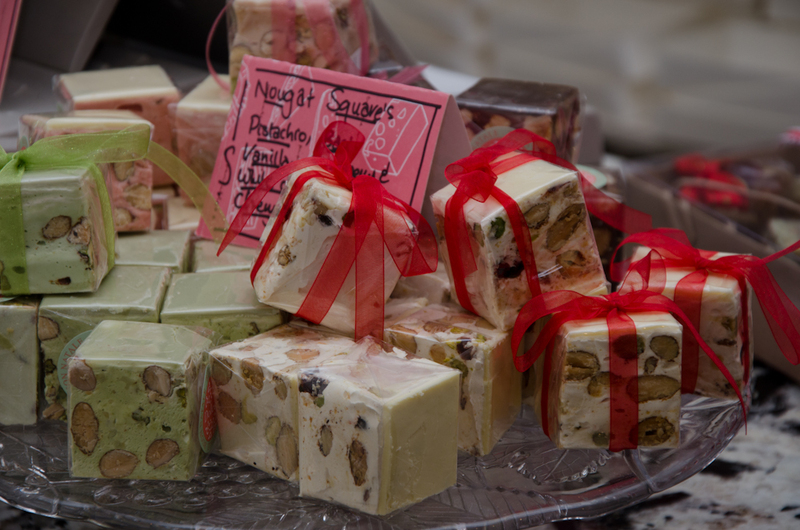 There are torroni ( plural of torrone) in various colours and flavours: almond chocolate, vanilla rosepetal, strawberries and white chocolate, chocolate baci, vanilla, roast almond and orange blossom, pistachio and almond……Marianna is famous for her hand made sweet things. f Some of you who live in Australia may have seen her on TV, Italian Food Safari (SBS) making her torrone (nougat). There is also a book of the series published by Hardie Grant. GIUGGIULENA (also CUBBAITA) – a brittle Sicilian toffee of sugar and honey with sesame seeds and almonds. 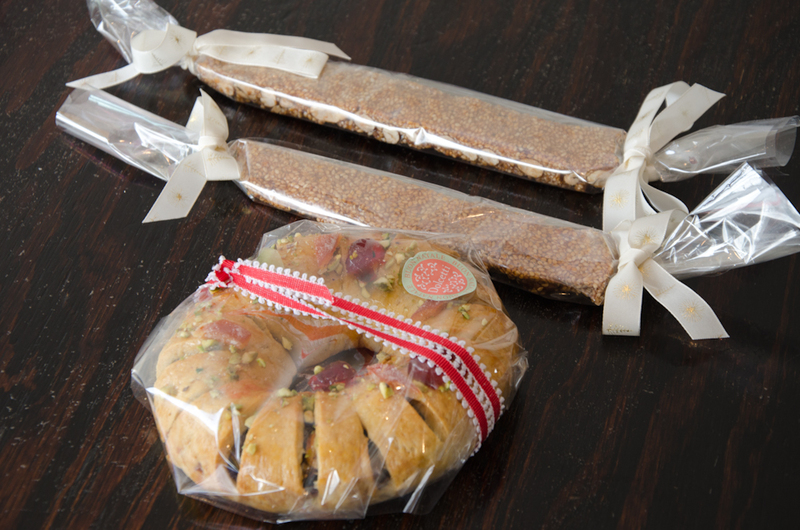 Also particularly Sicilian is the Buccellato (in dialect “cucciddatu”); This is made in the shape of ring and is stuffed with nuts and dried fruit. Photo of Giuggiulena and Buccellato above. (different ingredients) in various shapes and sizes. 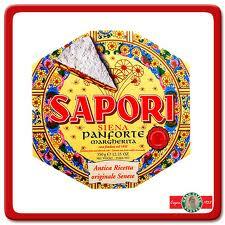 It’s served in thin slices like torrone and keeps very well. 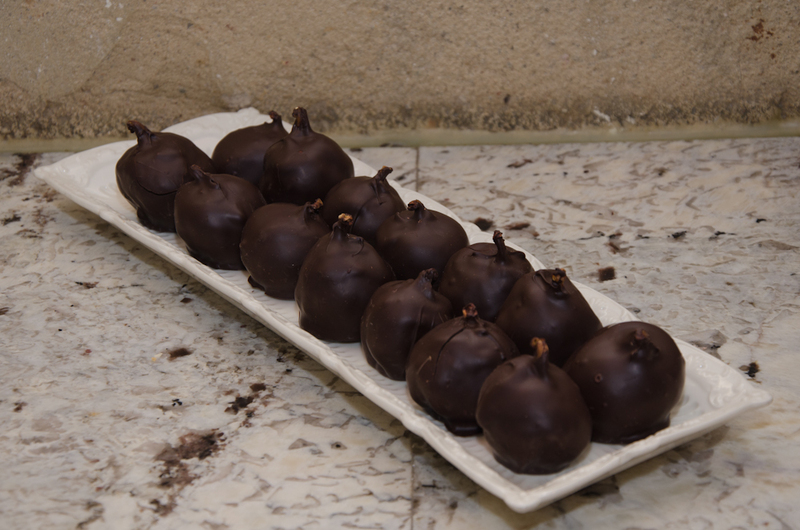 One of my favourites are the dried figs filled with nougat and dipped in dark chocolate; a version of these are also a popular Christmas sweet in Calabria and usually stuffed with almonds or walnuts and candied orange peel. Pignolata is a typical sweet of Sicily and Calabria that is popular at Christmas and during Carnival festivities. 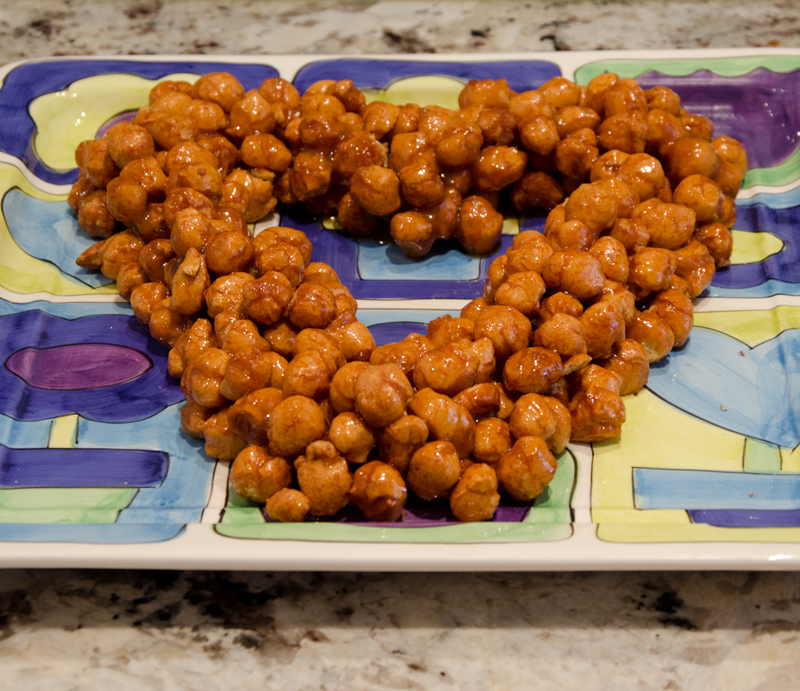 These are balls of fried dough (they look like large chickpeas) and covered with warmed honey. 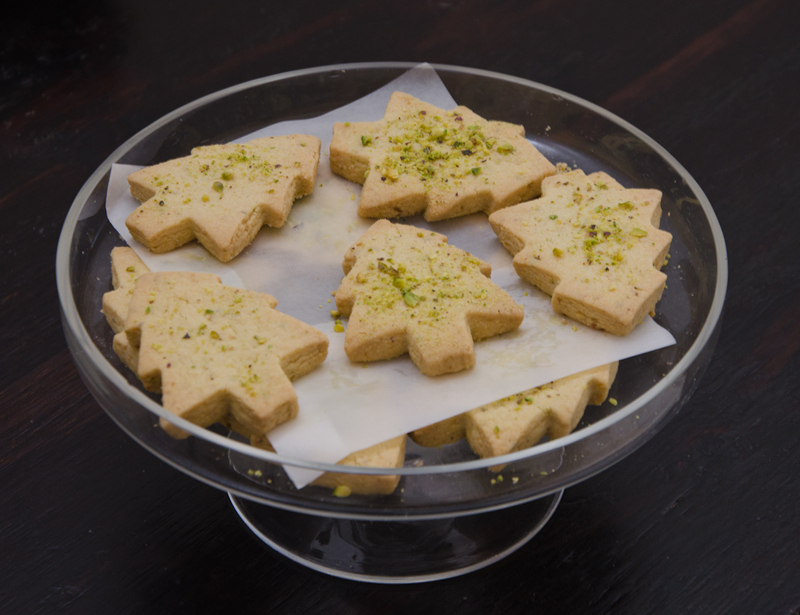 She is also highly respected for her different almond biscuits (she is of Sicilian heritage after all) and of these you will find many varieties, however she also makes similar ones with pistachio; one these are the Pistachio Shortbread Biscuits. This is Marianna’s recipe. Combine butter and icing sugar. If using an electric mixer it is important that you do not overbeat the butter and sugar as this will add too much air to the mixture. Another way to view this is that the butter must remain yellow and not the pale colour that results when butter and sugar is beaten for a considerable amount of time. Add ground nuts, and then the flours last of all and mix until mixture comes together. Once again, do not overwork it; being short breads using your fingers to rub in the flours may work best. Turn onto a lightly floured surface and with a sharp knife or biscuit cutter cut into preferred shapes; Marianna has cut hers into Christmas trees. Place the biscuits on oven trays lined with baking paper. Space them about 2cm apart. Bake in 180°C oven for 10 -15 mins or until lightly golden (but being short breads they must still be pale in colour). When they are still warm sprinkle with crushed pistachio nuts. Cool and store in a tin. Fresh Fruit tart – think of Australian summer fruit! Tronco di Natale is a Christmas log (Bûche de Noël), a popular Christmas dessert in many countries of Northern Europe. 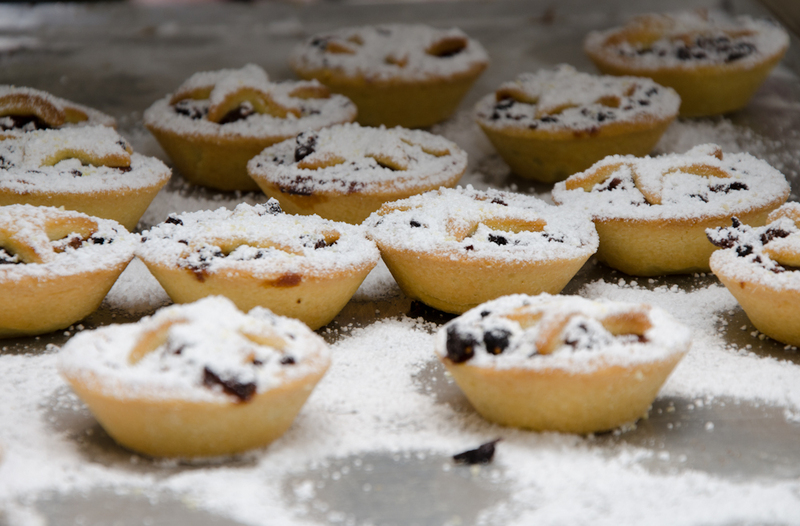 There are fruit mince tarts for those who wish to stick to the Anglo tradition. Marianna and her pastry chefs are having a good time and inventing some sweets with whimsical names, i.e: Rudolph’s Karolina. 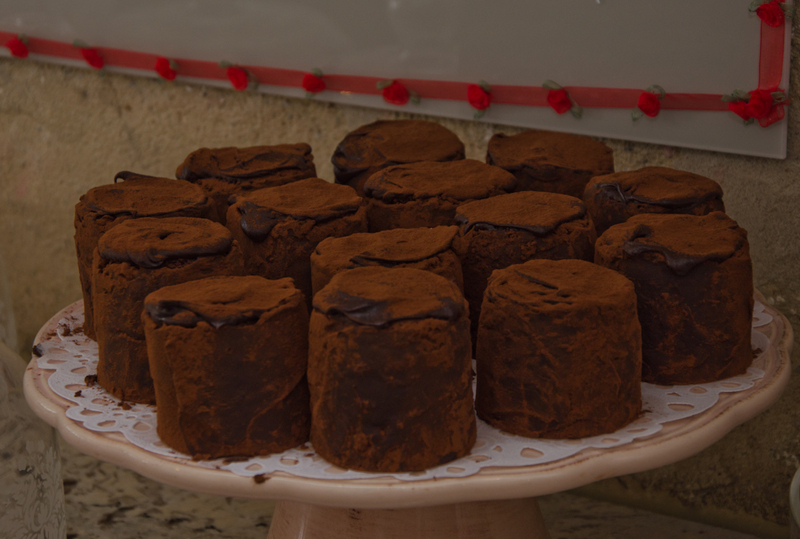 Tartufo tortina, is not particularly tied to Christmas, but who can resist these? And there are so many more, too many to mention in this post. What is it about zeppole that has everybody drooling? 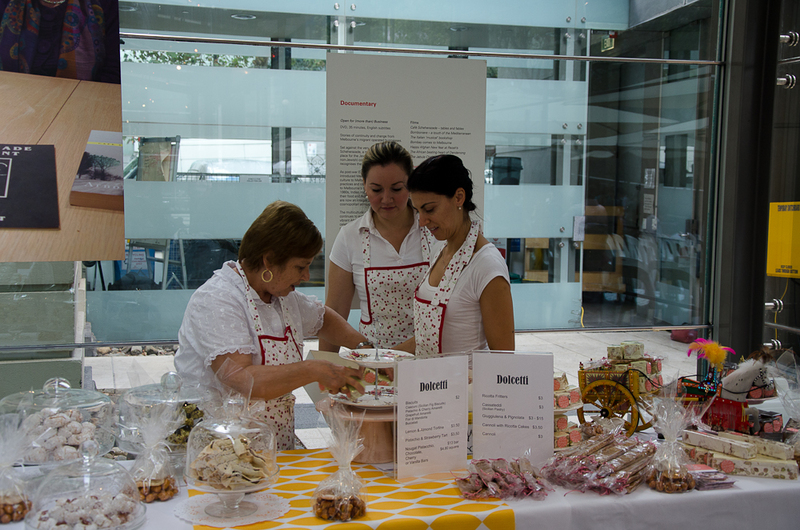 Lidia, Marianna’s mother from Dolcetti, had customers lining up for hers at the Sweets Festival held recently at the Immigration Museum. She began mixing her first batch of dough with ricotta – this is very traditional when making the sweet version of zeppole. The next batch had fennel seeds and a pinch of chilli; what was interesting about hers is that even this batch was rolled in caster sugar – I love that mix of savoury with the sweet that Sicilians are particularly proud of. By the end of the day someone was sent out to buy more flour and the zeppole were just plain dough rolled in castor sugar infused with vanilla bean and still the customers lined up and were prepared to wait for their order. Now the funny thing about zeppole is that they are called by different names in various parts of Sicily – sfinci, sfinci di San Giuseppe, sfingi, crispeddi, sfincia: Whatever they are called, they are traditionally eaten at the feast of Saint Joseph – who looks after the poor, and San Martino – he looks after wine. Some Sicilian variations include a ricotta filling (rather than in the mixture). Different versions of these fritters are found all over Italy. In Trieste and Venice they are called frittole – this version has sultanas (soaked in rum beforehand) and rolled in cinnamon in the castor sugar. When the Triestini side of my family made them, they also added lemon or orange peel to the mixture – these are traditional at the time of Carnevale. In Naples they call theirs graffe. Older people living in Adelaide may remember Asio from Asio’s Restaurant. He was from Tuscany and he called his frati. I knew Asio when I was a child and he used to make these for my family. The traditional dough is basically a sloppy bread dough made with yeast and warm water with a little sugar and a little salt. *You could cheat and use self raising flour and no yeast. They taste pretty good but remember that although you are making the easy version, they will not be traditional. salt and pepper – sprinkled on top at the end. Mix 1 cup of flour with ½ -¾ cup of warm water, sugar and the yeast. Add more water if necessary to make a sloppy dough. Cover it and leave to rise in a warm place for about 45- 90 mins – the dough should be spongy and double in size. Add the rest of the ingredients except for the anchovies and the fennel seeds. Mix well; the mixture should be soft and pliable. Add the anchovies and the fennel seeds and gently mix through. Heat frying oil, drop into the oil one tablespoon full of dough (cook only a few per time – do not over crowd the pan). To see if the oil is hot enough, test it by dropping small bits of dough into it – the dough should begin to cook and begin to gently bounce around. Turn the zeppole once to fry on both sides – they should be golden brown when cooked. Sprinkle with a little pepper and salt. The majority of people love SWEETS and even those who are not gluttons for all sweet things are tempted by some sweets. For example I am not a great fan of cakes nor large quantities of puddings but I do like dolcetti (Italian for little sweet things) like biscuits, especially Sicilian almond biscuits and torrone. How many of you have tried giuggiulena or know what it is? What about pignolata? I love small moist ricotta filled cannoli …. 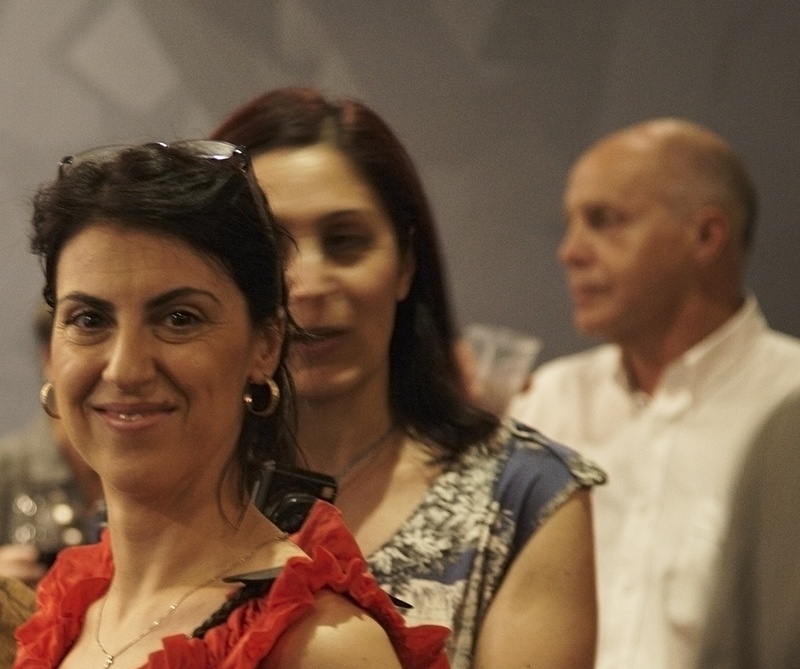 All Sicilian, all exceptional, traditional and exquisitely made….and where else (Melbourne and the world!!) besides Sicily will you be able to sample these sweets? 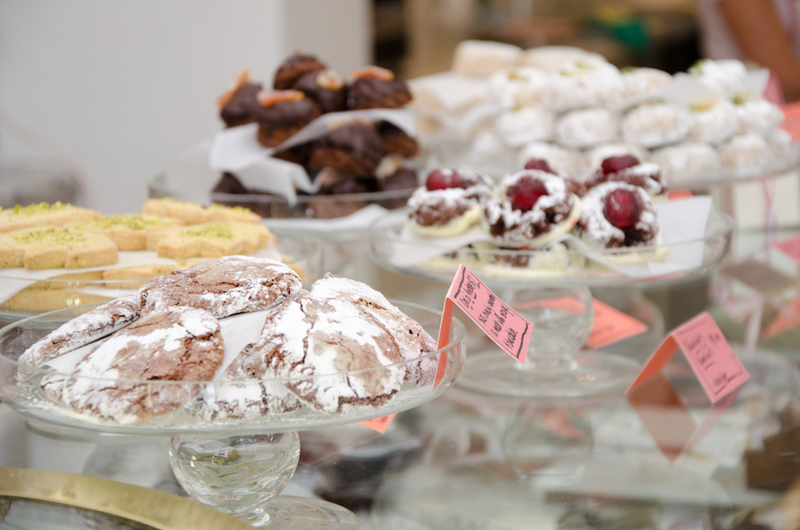 You can taste them in Melbourne at the small and brilliant pasticceria, Dolcetti, where Marianna di Bartolo carries on a Sicilian tradition of exquisite sweet-making inherited from her family. 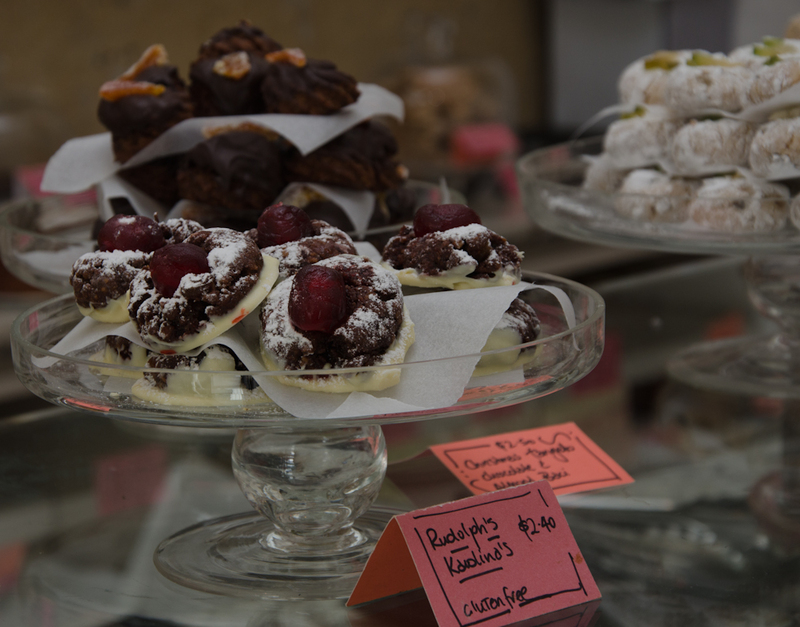 But you will also be able to taste and purchase her sweets at the Sweets Festival at the Immigration Museum on Sunday 18 March 2012 (11am to 4pm). And Marianna will not be the only one offering her sweets and demonstrating some of her craft. 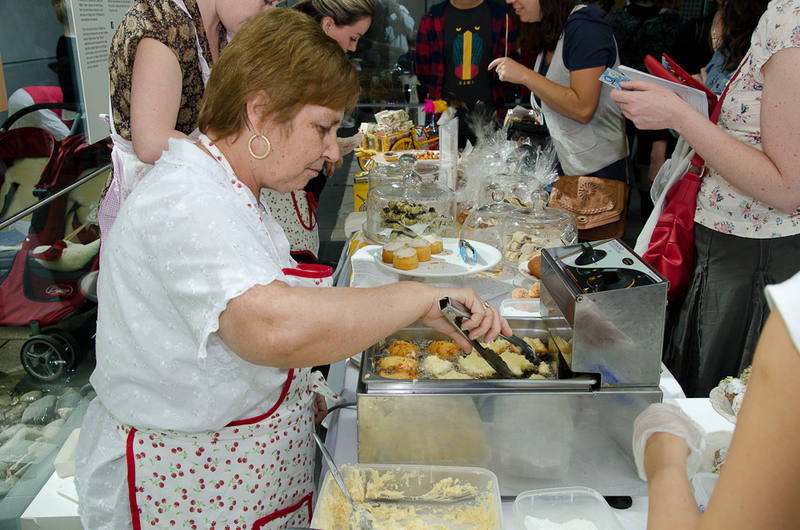 This one-day festival of food and culture is a feast of toothsome sweet (and savoury) food stalls, film, music and dance performances, cooking demonstrations and workshops. along with Marianna’s sweets there will be baklava, mochi, moti choor ladoo and napolitains as well as numerous other delicious treats, along with flavoured teas, coffee and sherbet. 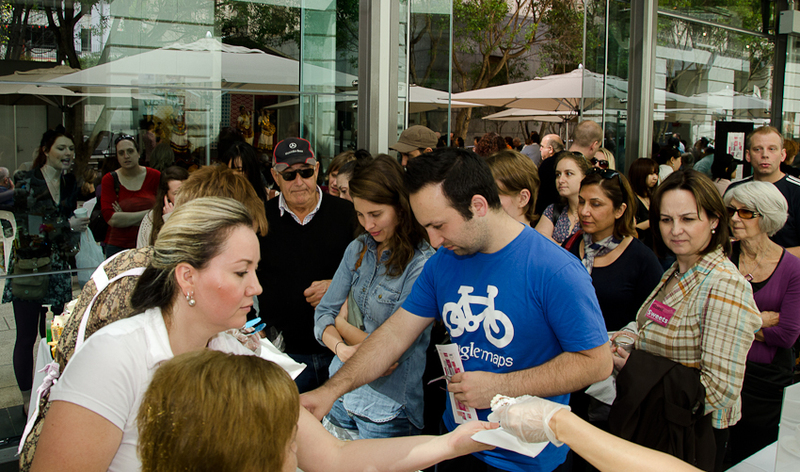 During the day there will be short tours of the Sweets: Tastes and Traditions from Many Cultures Exhibition – this exhibition begins on 15 March 2012 to 7 April 2013. For the past six months I have been part of a group coordinating the Sweets Exhibition at the Immigration Museum. This is a Museum Victoria project and is also part of the Melbourne Food and Wine Festival. 2012. The Museum worked collaboratively with a number of Victorian communities to produce an exhibition and festival themed around sweets, highlighting shared cultural traditions, rituals and contemporary practices.The Italian, Indian, Mauritian, Turkish and Japanese communities have been invited to participate. Obviously I am a member of the Italian group. These communities were chosen because of their differences in food traditions and their geographical diversity. I have always been interested in the historical and cultural significance of ingredients and cooking methods and the culinary variations between cultures and even within the same culture. Readers of my blog and my book will know about my interest in the origins of Sicilian recipes shaped by the Greeks, Arabs, French and Spaniards. Mauritius, Turkey, Japan and India all have unique histories and very different cultural and climatic influences that are reflected in what they eat. Tara Rajkumar Natya, Sudha Dance Company. The performance explores treats of two of the Hindu Gods – Ganesha’ s modakam dumplings and Krishna’s favourite pudding pal payasam. A dance theatre performance by the Turkish Ekol School of Arts. Discover the importance of baklava at an Anatolian wedding. A musical concert with a Japanese shiobue flute and taiko drumming from the Fuefukuro trio. Sego Lebrasse and dancers will present a Mauritian sega. The Bumbroo Dance of the Bumblebee by the Kashmiri Pandits Cultural Association. A Japanese tea ceremony demonstration with the Chado Urasenke Tankokai Melbourne Association. I have just returned from a trip to Vietnam and loved sampling different foods and flavours from the street stalls to traditional eateries to sophisticated dining rooms. Desserts, as we know them, are not generally eaten in Vietnam. Meals are most likely to be finished with a selection of fabulous fresh fruit, if anything. But sweet snacks are available on the street all day long. 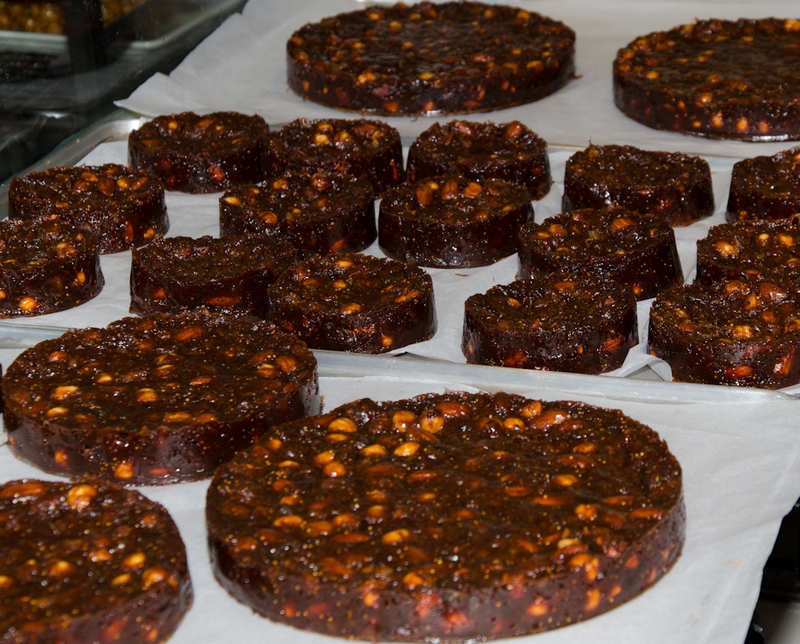 Sweet cakes, snacks and specialties such as coloured glutinous rice enclosing sweet bean paste, are also made for special occasions, Buddhist festivals and other celebrations. It seems that wherever you go, there is always something sweet to eat. They may not always be nutritious but they always nourish some part of us. The event was organised by Christine Gordon. After this event I went home and made a wild fennel frittata and had it with a bottle of Rocky Passes Estate syrah – a very fine wine and the only bottle left over from the book signing event held in Readings in Hawthorn (Sicilian Seafood Cooking). Friends Vitto Oles & Candi Westney own and run Rocky Passes Estate and they graciously donated the wine for the Readings event. Vitto is the viticulturist and wine-maker of exceptionally good Syrah and Candi is just as important because she is responsible for the entertainment – the music concerts, performances and art exhibitions. Both manage the cellar door and the range of appetising Argentinian/Spanish inspired morsels (tapas) that are available when you visit their winery. Rocky Passes Estate is at the spectacular southern end of the Strathbogie Ranges, near Seymour in Victoria. If you look at their wine label you will notice two eagles – these birds are often soaring above their very attractive property. The winery is relatively new and had its first vintage of Syrah in 2004 and every vintage since has been highly rated by James Halliday. The winery is open Sundays 11-5pm or by appointment and Tapas also served onthe last Friday of the month as well as during art openings and special events. I love wild fennel and when I find it I use it. I have written about frittata in a previous post and as you see it is not difficult to make. The fennel can be replaced by any wilted green vegetable, for example spinach, endives, spring onions or asparagus. Wild greens are superb or you can use bulb fennel, but keep the greens.You can vary the amounts of vegetables but as a general guide I would use 3-4 eggs to a cup of greens. For this frittata I used 12 eggs and it fed 4 of us (we were greedy). Remember to use a spatula to lift the cooked part of the frittata as it cooks and release the uncooked egg. Need I say that I only use free range eggs? Then flip it over – I used a pizza tray. Finally, slide the frittata out. At the Readings book signing event I accompanied the Rocky passes with green Sicilian olives (olive schiacciate), marinaded anchovies. 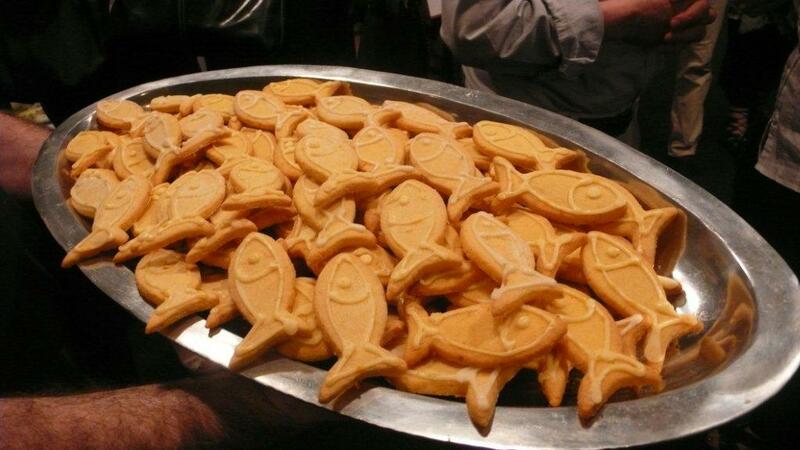 Marianna Di Bartolo from Dolcetti made more fish shaped biscuits for this occasion and once again these were perfectly matched with Brown Brothers’ Zibibbo. 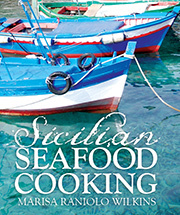 And once again it was an other fine celebration for Sicilian Seafood Cooking. One upon a time, when people talked about “launching” something, they were usually talking about ships and the launch usually involved some celebrity smashing a bottle of champagne across the bow and standing back to watch the hull slide down the slipway and into the water! Or spectators crossing themselves and praying for the vessel’s safe voyages. My feelings of anticipation, excitement and relief were just as intense when Richard Cornish launched my book, Sicilian Seafood Cooking, at the Museo Italiano in Faraday Street Carlton, last Sunday (6 November). 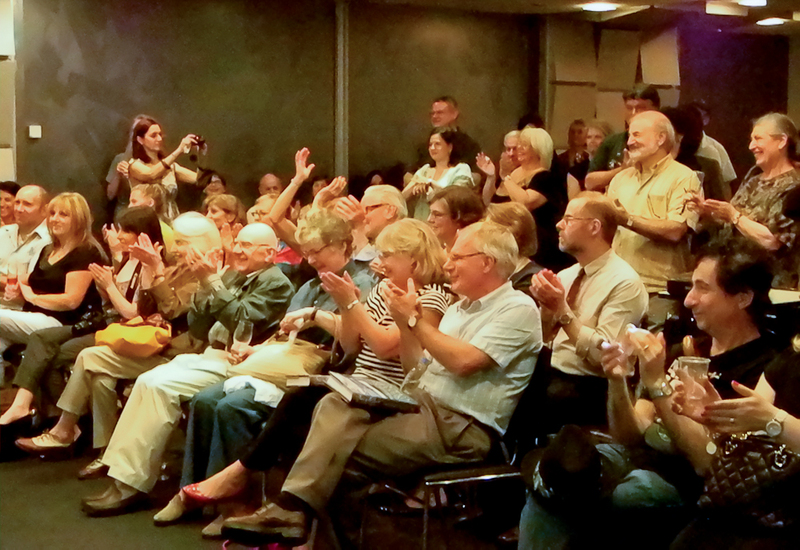 And while Richard didn’t crack a bottle of champagne over the lectern, and I did not make the sign of the cross, there was certainly plenty of wine, food and bubbles to float my book out into bookstores, and a great crowd of well-wishers who to lent a hand to see it on its way. All of them need to be thanked. First, thanks to the staff of CoAsIt and the Museo Italiano [link to http://www.coasit.com.au] especially to Carlo Carli who is the Coordinator of the Museo Italiano, and Rosaria Zarro, Italian Education Officer at CoAsIt, who hosted the launch in the spacious and well-equipped conference room in Faraday Street, Carlton. Special thanks to Richard Cornish, award-winning author and journalist. I have always admired Richard and his writing and I am deeply honoured and seriously grateful to Richard for launching Sicilian Seafood Cooking. Richard [link to http://www.profiletalent.com.au/richard-cornish ] is best known to readers of Epicure (the Age) and Good Living (Sydney Morning Herald) for his articles on food, concentrating on ethical and sustainable production. Richard has also co-authored a series of books on Spanish cuisine with Frank Camorra, chef and owner of Melbourne’s Movida restaurants. The latest book MoVida Cocina is published in November 2011 so I know how busy he must be. The wine was generously provided by three producers – two of them, family companies, Coriole and Brown Brothers – and the other, a major producer of wines in Sicily, distributed by Arquilla Food and Wine. Coriole [link to http://www.coriole.com] provided two varieties of Sangiovese, a wine whose Italian origins are most closely linked to Tuscany. Led by Mark Lloyd, Coriole has ventured further and further into the production of Italian varieties in their McLaren Vale vineyards, south of Adelaide. Coriole began with Sangiovese in 1987, and followed by Nebbiolo and Barbera. The experimentation has continued with plantings of Fiano (recently awarded Best McLaren Vale White Wine), Sagrantino and Nero d’Avola, which is yet to have a vintage – maybe next year. Brown Brothers [link to http://www.brownbrothers.com.au] provided a sparkling Zibibbo, the Sicilian name for a grape originally named Muscat of Alexandria. You can never finish a meal in Sicily without being offered a glass of Zibibbo! [link to http://www.snooth.com/varietal/zibibbo/] Brown Brothers, who established their first vineyard at Milawa in the lower King Valley, grow the grapes for their Zibibbo at their Mystic Park Vineyard beside the Murray Valley Highway about halfway between Kerang and Swan Hill. Arquilla [link to http://www.arquilla.com.au] supplied traditional Sicilian wines, Nero d’Avola and Frappato, produced by Feudi del Pisciotto. [link to http://www.castellare.it/eng/introFeudiPisciotto.html] I first tasted the Feudi Nero d’Avola at my favourite Sicilian restaurant, Bar Idda, [link to http://www.baridda.com.au] another fabulous family affair in the hands of Lisa and Alfredo La Spina, with Lisa’s brother Anthony managing the bar and the drinks. The book didn’t just float out on glasses of Sicilian wine. There was a selection of tasty finger-food (or as they are called in Italian, spuntini). Lisa and Alfredo from Bar Idda contributed roasted peppers [link to http://www.baridda.com.au] l Iove to eat at their restaurant! The highly capable pastry chef, Marianna DiBartolo, who owns Dolcetti, [link to http://www.dolcetti.com.au] a Sicilian-inspired pastry shop (pasticceria) in North Melbourne, made special fish-shaped biscuits for the occasion, which were perfectly matched with the Zibibbo. [link to http://www.seafoodnews.com.au] which I contribute a recipe to every month. Agi held the publication so that he could include photos from the launch, which deserves a special thank you, and has given it a whole page in the November edition. And Danielle Gullaci from Italianicious, [link to http://www.italianicious.com.au] the bi-monthly magazine which celebrates all things Italian, and which is publishing an article on me in the January-February 2012 issue. *Entry is free but you must book before Monday by phoning: 9819 1917. 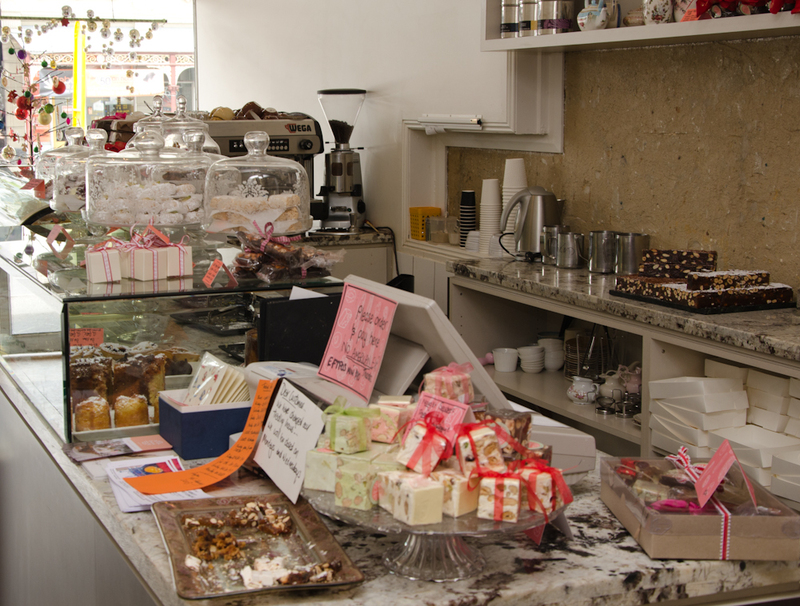 Il Mercato specialises in Italian food, wine and culture. 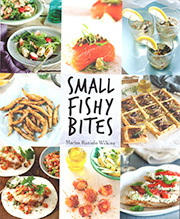 Sicilian Seafood Cooking will be launched by Rosa Matto [link to http://www.rosamatto.com] – a great friend and a cook I’ve admired and respected for as long as I have known her. Rosa and I will be introduced at the launch by the newly appointed Minister for Education and Child Development in South Australia, Grace Portolesi MP, the Member for Hartley (which includes Campbelltown).